— Anthony Freeman, Cycle Hokkaido June 2015. Cycle touring in Hokkaido is a smorgasbord of delights. Smooth wide roads curl over rolling hills amidst a rural tapestry of curated pastures. Here the vivid colours of the lavender fields are interspersed with vast fields of crops. Perfect black top beckons you on through this landscape as volcanoes, coastal villages, caldera lakes, world heritage wilderness and high peaks with the last of the winter snows (to August) provide a stunning backdrop. And throughout you stay in mixed accommodations, some traditional Japanese Inns, with great local food and of course, in most places, muscle relaxing natural hot spring baths. Our 10 day “Wild Hokkaido Explorer”, takes you from the World Heritage of the Shiretoko Peninsula in the east; through the Caldera lakes district, to the wilds and heights of Japan’s greatest national park, “Daisetsusan”. Our 8 day ”Playground of the Gods” ride, circumnavigates Daisetsusan National Park, with a day to explore the wilderness of Kuro Dake & the majestic Sounkyo Gorge. We pioneered guided cycle tours in Japan and with us you get the result of over 30 years of organising and running cycle tours in this enigmatic land. 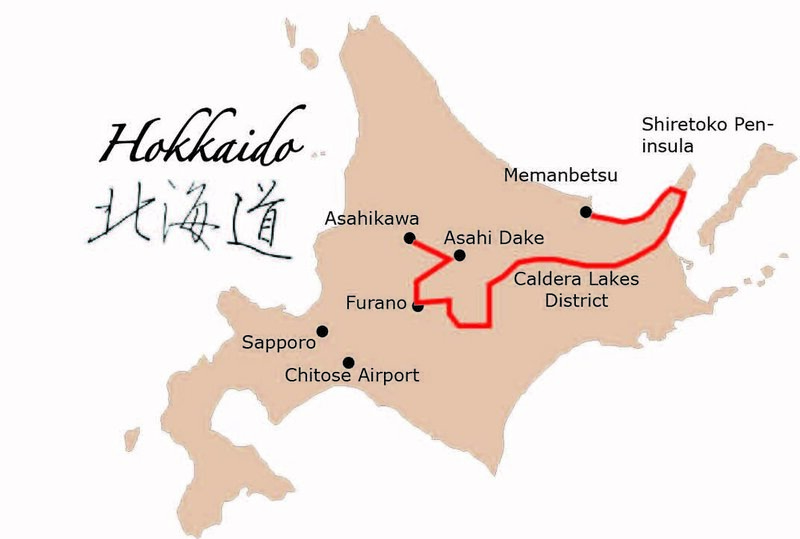 Contact us today to begin your own cycling adventure in Hokkaido Japan. Stay in some Traditional Inns and eat delicious Japanese food. Support vehicle, bike mechanic and bilingual tour ride leader. Cycle from 34km (21 m) to 101 km (63 m) per day. Cycle world heritage & national parks, past caldera lakes and climb Hokkaido's highest mountain, Asahi Dake, 2290 m (7513 F). Smooth hot mix roads and low vehicle speeds. Relax in inside and outside hot spring baths. We really enjoyed the smaller family run inns, and the food was great. The scenery was spectacular and variable. Your knowledge of the area provided insight into the region. I think the option of side trips on some days to allow people to explore the area from a different perspective is a nice addition to the tour. Land Price: $AU4990 - ¥430,000 per person. Single option (where available) $AU560 - ¥40,000. 11 days/10 nights. Season and Departure Dates: We run this tour to coincide with the best of Hokkaido's weather. Land Price: $AU3890 - ¥330,000 per person. Single option (where available) $AU390 - ¥32,000. 8 days/7 nights. Private Groups: This guided departure is available for private groups, and can be modified to suit group rider needs. Contact us to arrange a private departure. Accommodation: We use a range of accommodations including 5 luxury nights, standard mountain inns & some western style Hotels. See our accommodation page for more details. Grade: Level 1 (moderate to strenuous). See our grade page for more details. How to book: Download a booking form or contact us. Send the booking form via email or post with $AU250 deposit/person. All credit cards accepted.